In the parts of the world, or more specifically, the regions and places where snow has a direct influence on people’s lives, it is quite common for people to have different words describing the characteristics of the snow based on how it influences their lives in different ways. A few different ways this can affect both urban, but more importantly rural life in are e.g. small pragmatical concerns as in what clothing and footwear to wear, or a need to manage fallen snow near or on the housing, or even various effects on things like moving, navigating and hunting. It also predicts expected larger changes in climate as the seasons change, through particular smaller effects in the transitionary period inbetween seasons. And it can even affect us spiritually, as in changing our mood and in giving us a sense of beauty and wonder. The characteristics of different types of snow depend on where in the air it is created and at what temperature, which directly affects the shape and behaviour of the snow flakes. It is also strongly connected to other atmospherical influences like wind. The terms primarily revolve around the “dry” or “wet” aspects of snow. Briefly described, Dry snow is so cold that it doesn’t easily melt, even on your warm clothes. It also doesn’t stick together with other snow as easily, which is important. Wet snow, on the other hand, is the direct opposite. It is compact, sticky and heavy as well as water-rich, which has both positive and negative side effects. And it sticks to fuzzy wool clothing as glue. Scandinavia is of course a part of the world that is commonly directly affected by all this, although some parts see little snow. And it has changed with time. The North, where I come from, today sees less of it than when I was a child. Back then we had about six months of snow, and I regularly couldn’t see out of my ground floor window around January, after my father had shoveled the heavy snow off of the roofs. Today however, the climate has changed and there is far less snow, although still commonly one or two good feet of snow in the shortened wintertime. Also, the understanding of the various aspects of snow, while partly learned intuitively from kids games, of course diminishes with adult urban life, mostly boiling down to realizing that snow needs to be wet to be able to make snowballs and snowmen. The very first snow that falls, and stays, is called nysnö. In properly cold climates it is often light and powdery, collecting into a porouse layer. The word is not generally used to describe the type of wet snow that falls in somewhat warmer parts as that type of snow only stays for a day or two, quickly turning into slush. This snow is spiritually quite important, as it transforms the landscape from a dark and wet Autumn landscape, into a bright white winter scene, something which has a huge impact in a part of the world where you in wintertime only see the sun for an hour or so, spending the rest of the day in dawn, twilight or pitch black darkness. And not only does it brighten up the landscape, it also silences it, further adding to the sense of tranquility and calm. Dry snow is not a term really used much in everyday speech, but one I here choose to use to categorize the sub types of snow that share similar, but not identical characteristics. All of them only come with consistently colder temperatures at about -5C or more, although strictly speaking only -2.2C is required, provided that the ground is frozen. For warmer temperatures it will just turn into wet snow as it collects on the non-frozen ground. In common for all dry snow that it is fast to ski on as it doesn’t stick to your skiis. Due to its lightness it is also quick and easy to remove. However it is difficult to use as a material, apart from the particular skare, which I will return to later. When it comes to melting it for drinking water, large volumes result in small amounts of water due to its porosity. The same also causes it to drift with the wind. Pudersnö is, as its name indicates, light and powdery, usually consisting of crisp medium-sized flakes, but refers to how it behaves on the ground, not as it falls. Pudersnö as it falls is instead called Flingsnö, and if wind wisps it around it is called yrsnö (whirlysnow) or snöyra (snowwhirl). Powdersnow is the type of snow downhill skiers tend to prefer as it is soft to fall on, but dry and non-sticky so skiing is still fast and easy without risk of getting particularly wet. For cross-country skiing however, a lot of powdersnow can be frustrating, which of course is even more true for a lot of wet and sticky snow. 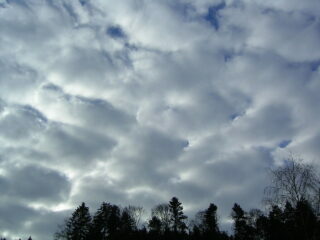 Stratocumulus clouds, one of the two clouds that give off “cornsnow”. A particular type of dry snow is called Kornsnö and consists of flat snow grains of about 1mm in size. These are formed in stratocumulus or the low stratus clouds that form at 50-500m height and are common with sudden and strong cold, not seldom with winds. Larger grains of about 2-3mm, or more, are called Snöhagel. Moving down to even smaller snow particles, the isnålar (ice needles) fall from clear skies and consist of such small ice crystals that they appear to hover in the air. They are basically crystalline condensation of water vapor in the air. Ice needles sometimes also refers to a particular type of extreme frost where ice crystals protrude like long needles. Frost is similar to ice needles, but refers to a thin, sparkling crust of ice crystals forming on all solid surfaces of a landscape, even on the top layer of snow. 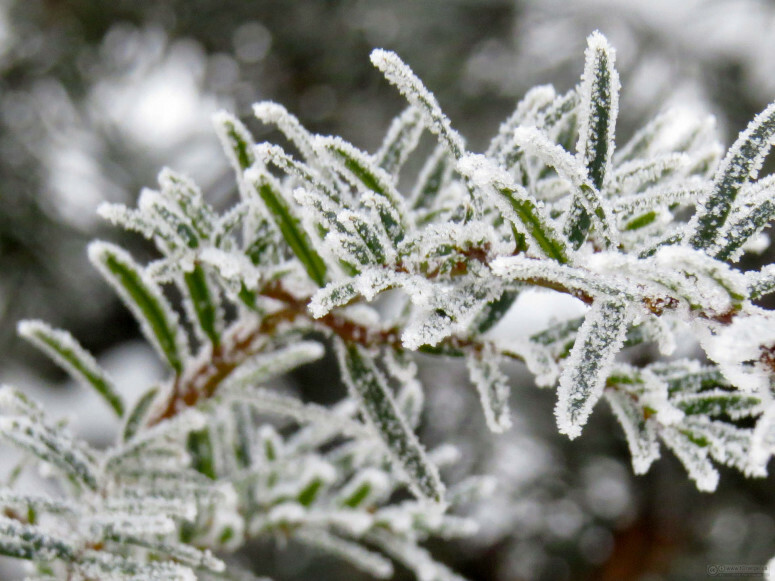 Rimfrost comes with humid conditions quickly transforming into subzero temperatures, freezing up the water in the ground level air, or water vapor from the ground, to ice. Frost can also form over several days with growing layers that build up to fantastic crystalline shapes. Like the newsnow it is considered very beautiful and a sign of winter coming. This term more highlights the porosity of the snow, which is important if you plan to travel over it. While light, it can also be energy draining if there is a lot of it. More commonly though, it means fairly easy travelling compared to the sticky and heavy wet snow, which can be a nightmare if you are pulling a heavy sled packed with equipment through already difficult terrain. “Snörök” in Sarek National park. 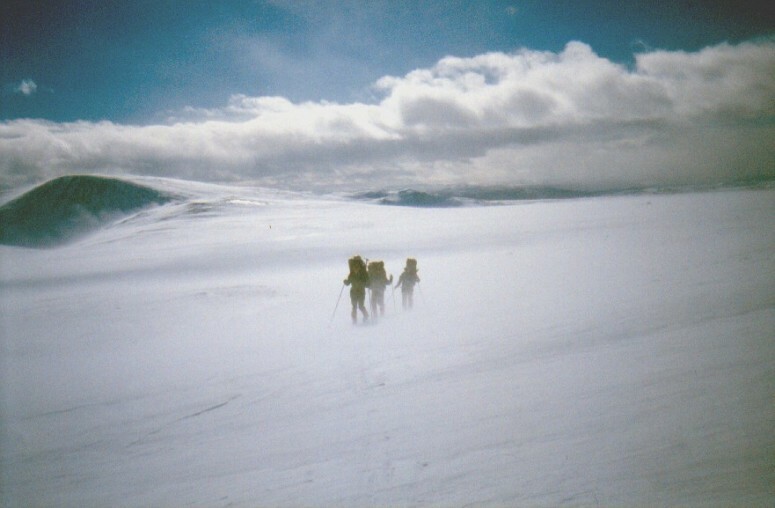 Snörök refers to powdersnow that blows with the wind, changing the visibility, which can be problematic and even potentionally dangerous. Unlike the snowstorm, however, it is usually quite short-lived lasting seconds rather than minutes or hours, but when caused for instance by a large vehicle that someone is trying to bypass in a smaller car, it can cause accidents due to obscured vision. 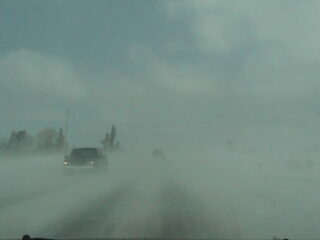 Drivsnö is again a result of wind, where large amounts of snow are thrown into the air by strong winds. Low and high drivsnö are generally separated between, where low is defined as lower than 2 metres and high as higher than 2 metres. With the lower, visibility is normally not impaired much, bit with higher it can be impaired quite considerably. With this, snow is blown and shifted around and collects in calmer areas. This means the wind can cover up as well as uncover things, hiding cracks and weak areas in ice, or icy and slippery patches, or cover ventilation holes in shelter and buildings, which all may need to be considered, depending on the situation. It also commonly causes problems for traffic as roads are blocked due to drifting snow. 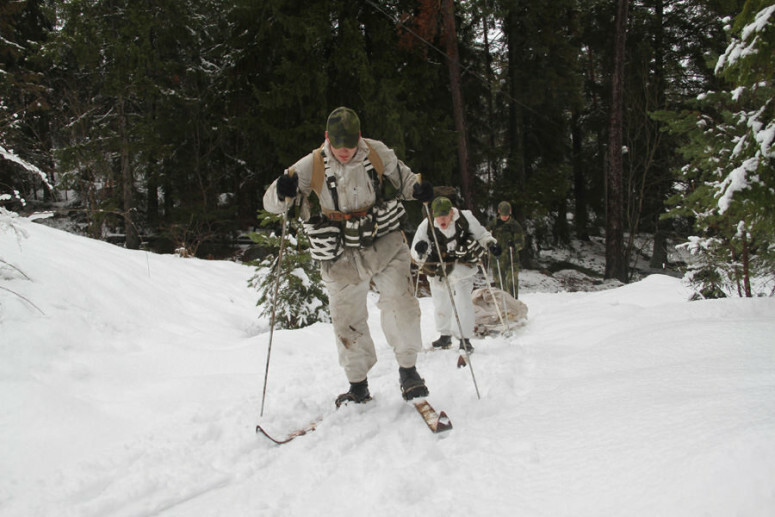 Unlike the rarely used term “dry snow”, Blötsnö is actually a very common word, used to describe compact, heavy and sticky snow. It is common at temperatures near the melting/freezing point. 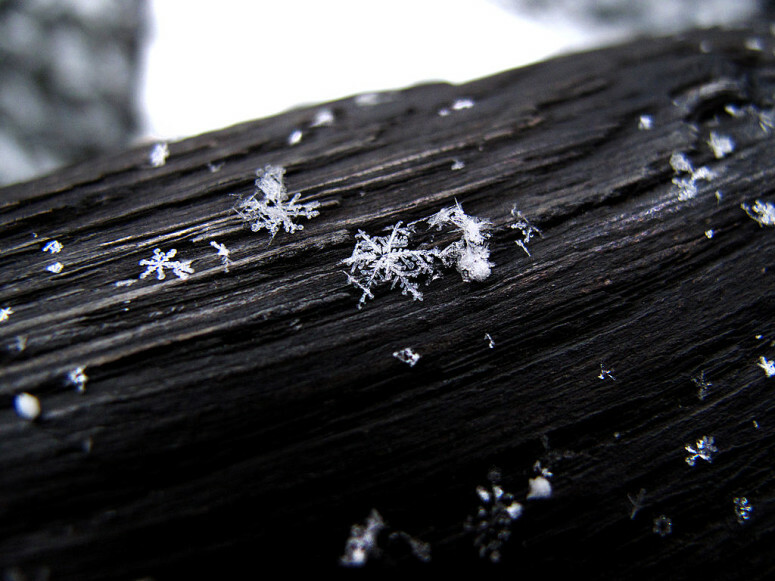 As the snow falls the snowflakes partially melt, changing their characteristics. The now sticky snowflakes commonly clump together to form large but still fairly light and flat shapes, commonly called “lappvantar” (Sami mittens) that fall slowly towards the ground, painting a beautiful and tranquil landscape. Due to its characteristics this snow is quite useful in that it can be clumped together to build things, like temporary shelter or be used as extra insulation or fastening for winter tents. Another commonly used word for it is Kramsnö (Pressnow), refering to how it can be pressed together into a ball. Dry snow can of course transform into wetsnow as the temperature changes, but the opposite is not quite true, as snow that refreezes instead turns into ice or skare. A problem with this compact snow however, is that it gets heavy and can damage both buildings and potentially be dangerous as it falls from greater heights. For that reason roofs need to be cleared of snow regularly in places where it snows a lot, or the roof might break. Likewise, icicles and ice needs to be removed from tall buildings as falling ice can kill people walking below. 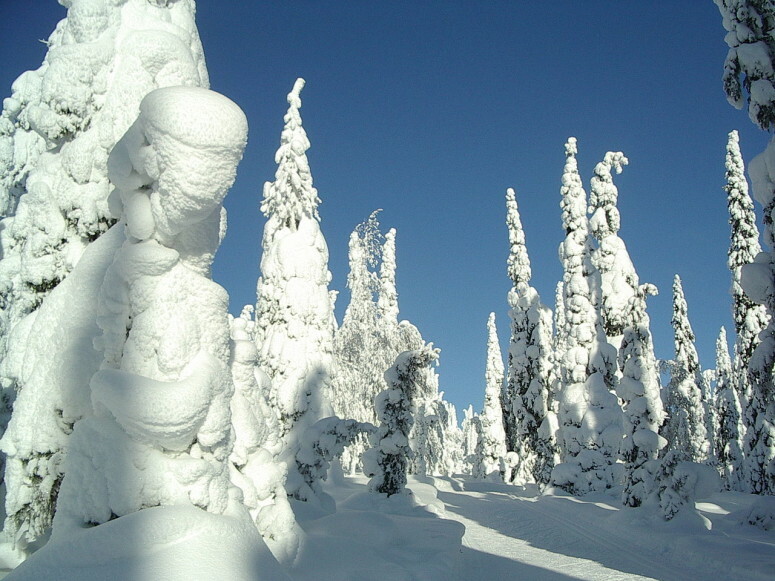 This type of snow is little affected by wind, which means it also preserves changes to it well, for instance human and animal tracks, or skiing trails, which has given rise to the term spårsnö (tracksnow). This naturally is important for hunters, but also means a cleared path will remain intact until new snow falls. And such a path can be made simply by walking or skiing back and forth. Other less fun aspects of wet snow, that comes near the melting/freezing point is Snömodd and Snöslask. This occurs in Töväder (Thaw weather), which in turn generally refers to returning of warmer weather, but isn’t restricted to Spring and can appear at any time of the season. This type of snow is very wet, almost turning fully to water, and is generally only appreciated by kids who like to build dams in the gutters and ditches around Springtime. Some terminology falls inbetween the ones already described, due to their particular characteristics, and here are a few examples of this. 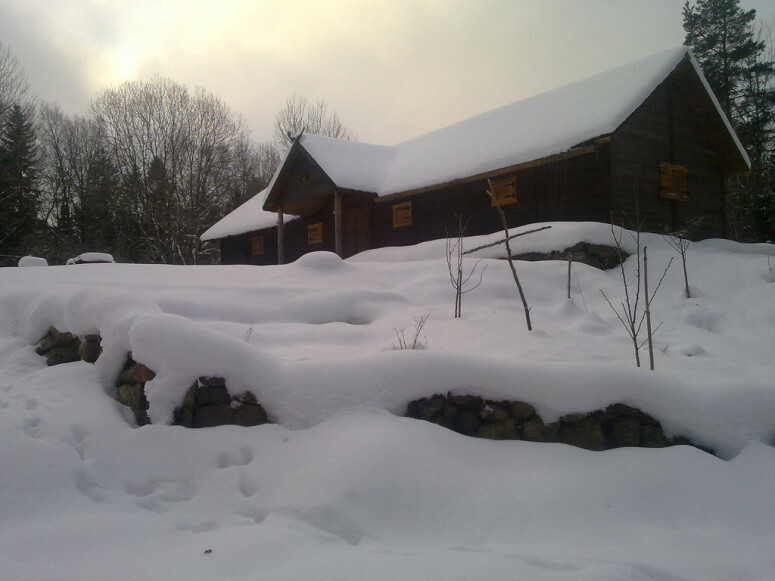 Skare is formed when the top layer of snow melts and refreezes, and snow can contain several layers of soft powdered snow layered with thin ice, as snow falls, melts and refreezes. All this can compress into a solid top layer called skare, that can be quite thick, counting in decimeters even, rather than centimetres, and can be quite strong. Children can walk on it, and adults can ski quite fast on it. For smaller predators like foxes and wolves however, it can pose a problem as it hinders them from hunting smaller prey that tunnel in the soft and fluffy snow underneath the hard crust. This is why you commonly see foxes jumping high as they hunt in wintertime, trying to break the crust. 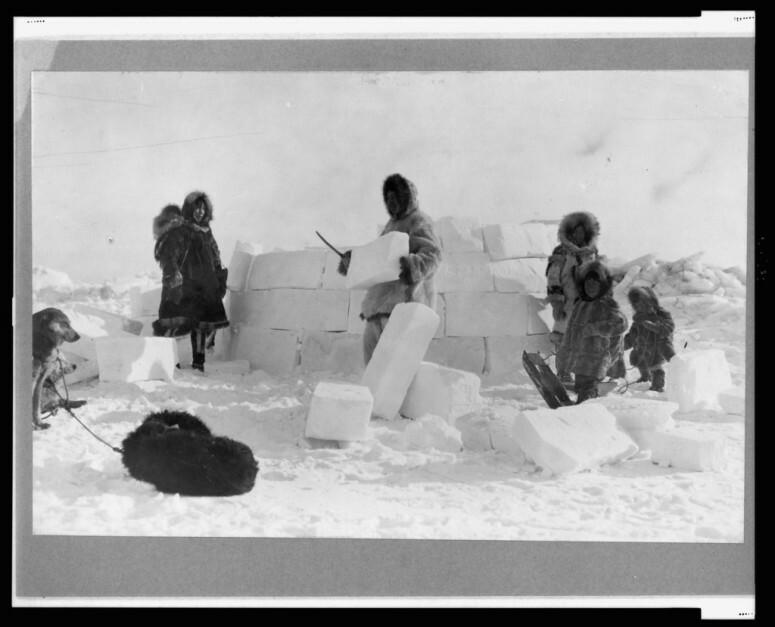 It can also be used to build igloos with, as it is quite light, strong and easy to shape into building blocks that form an igloo. For this, it is the best snow to use, even if wet snow can be used to build shelter too. Sometimes it is even possible to build shelter underneath skare, by removing deep and soft layers of snow underneath. As its name indicates this is snow that is packed tightly together, through pressure, wind and gravity. It is compact and hard and easy to travel on. It is common on well-travelled roads and trails, but can also be created by deep layers of snow compressing itself through sheer weight. It may also consist of layers of skare and compressed dry snow. Example of Upplega. Photo taken by Muu-karhu. 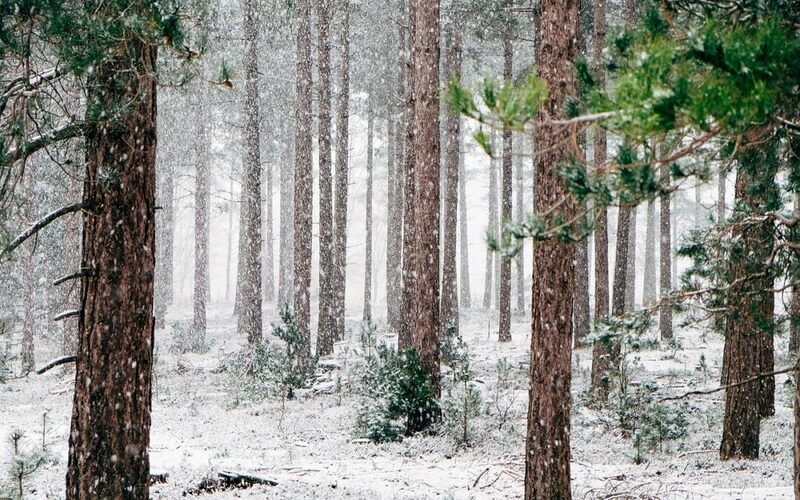 Upplega refers to the snow that collects on the upper side of tree branches and when it consists of wet snow, it can be quite damaging to the trees, even breaking off branches or injuring wood workers, especially common before the mechanization of the wood industry. This only occurs in late winter when the rays of the Sun are becoming stronger again. This can cause ice and snow to melt during the day, despite the temperatures still being below zero. This naturally is a sign of the coming Spring, and as such a positive sign that is greatly anticipated after a harsh winter. I hope this has given some insight into how and what influences the Nordic terminology for snow. As final words I will also add that it is good for winter campers in particular to know that all clean and white snow can be eaten without fear of poisoning. Most bacteria will be coming from your own hands so cleaning them is a much more important consideration. Far better than just eating snow, is of course to boil the snow water first. Snow itself contains rather little water, especially as powdersnow where the volume ratio is 1:30, and even for wet snow it is usually only 1:10. The notion that the snow contains microscopic worms and maggots however, is a myth and nothing more.